It has been eight years since Brian Trautman left his job, sold everything he owned and set sail for a seven-month cruise to Australia on board Delos. He’s still at it. Originally a software analyst, Trautman got hooked on sailing in 2001 after reading Three years in a Twelve-Foot Boat by Stephen G. Ladd. What time he didn’t spend working, he spent learning to sail and saving money. 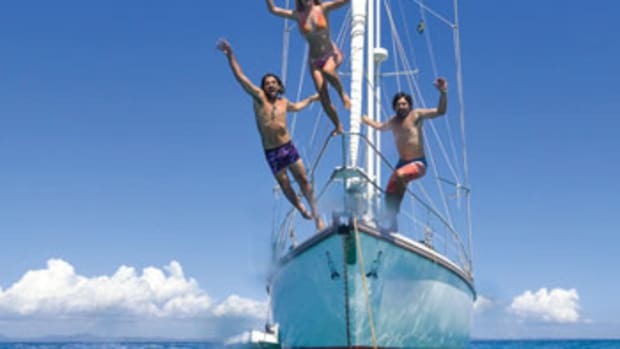 He took the leap in 2009 after buying the 53-foot Amel Super Maramu Delos. After he added video to his sailing blog, Trautman attracted as many as a million fans. The accompanying revenue from advertising and crowdfunding has kept his adventure going. He has a crew that includes his girlfriend, Karin Syrén, of Stockholm, and his brother, Brady. Life aboard Delos is not all fun and tropical adventures; the livelihoods of Trautman and his crew depend on their ability to churn out videos and photos for fans. This Soundings article has more.